NSBlock is the PUP that uses misleading techniques to prevent removal. Use Reimage to locate malicious components and get rid of them faster than with uninstall instructions. A full system scan blocks virus reappearance and prevents traffic to malicious domains. How did this extension find its way on my browser? How does the NSBlock removal work? NSBlock virus is a term that the computer security experts use to refer to a dubious computer security software designed and distributed by a German company called Domport GmbH & Co. This product is definitely not one worth trusting. Its official download site has been taken down, and the program now gets installed along with other freeware or shareware software . At the time NSBlock.net domain existed, the creators of this software have introduced this software as an innovative and perspective computer security service capable of providing protection against a variety of contemporary viruses, Trojans , and other malware. Nevertheless, its ability to protect users’ devices against malware has always been questionable. This presumption can only be justified looking at the size of NSBlock executable which reaches only 2 MB. A file of such small size is unlikely to hold any advanced utilities which would be able to protect computers from potential malware attacks or exterminate malware that is already on the system. Of course, it is not all hopeless. The program may block you from entering a few suspicious pages, but by no means should you trust it to fend off more sophisticated parasites such as ransomware . On the opposite, since this tool is monetized through pay-per-click  advertising, it may attract malware to your system through random and often unsafe NSBlock ads. We recommend staying away from any ads, pop-ups, banners and other links that show up while browsing the web until you remove NSBlock from your computer with the help of professional software, say Reimage. NSBlock adware displays all kinds of advertisements with the help of the invisible extension. You can see our researcher demonstrating this extension in the image above. 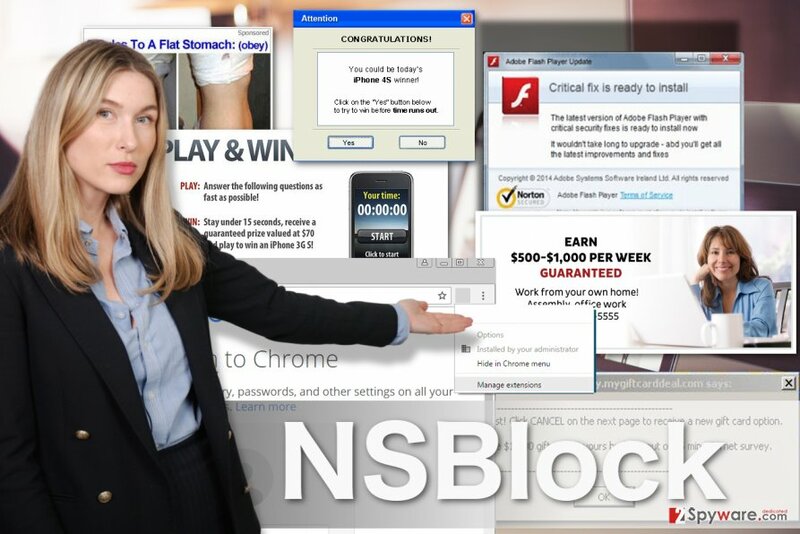 Since NSBlock is monetized through ads, the experts tend to call it an adware. There are two types of adware: legitimate and malicious, and, unfortunately, this particular application is leaning more towards the latter. Ads by NSBlock are unpredictable and may link to potentially dangerous web content including compromised tech support websites, phishing pages  and sites promoting fraudulent applications. The virus will make these redirects possible with the help of an invisible extension that it installs on the web browser. An icon of this extension is invisible, so it virtually impossible to tell it has been installed without going through the list of installed extensions. Needless to say, if you already find this component on your browser, you should disable it and proceed with NSBlock removal from the system. While the program is still on the computer, you should refrain from accessing online banking sites, social media platforms or email because you can never know what this invisible extension will be programmed to do next. Adware developers are always after the users who are less experienced in computing and can be easily coaxed into installing NSBlock or any other advertising virus on their computers. The best results are typically achieved when malware developers put a deceptive marketing technique called bundling into action. This method allows tying two or more programs together and spreading them in a single software package. The problem is that less experienced users take such software packages for granted and install them on their computers without investigating them closely. This way, NSBlock can slip into the system undetected. Advanced settings can be used to prevent such installs. You should opt for these settings before you begin the installation and look for undesirable components in the proceeding steps. Opt out the selected options manually by unticking the pre-marked check boxes next to them. If you are looking for a quick way to remove NSBlock virus, you will not do it better than by employing professional antimalware for the task. Automatic antivirus utilities are great for malware elimination due to several reasons: they save time, remove malware precisely and protect from viruses in the future. Nevertheless, it is not too difficult to carry out manual NSBlock removal either. Instructions provided below this article will guide you through the virus elimination process, so do not forget to check them out. Here, look for NSBlock or any other recently installed suspicious programs. Wait until you see Applications folder and look for NSBlock or any other suspicious programs on it. Now right click on every of such entries and select Move to Trash. When in the new window, check Delete personal settings and select Reset again to complete NSBlock removal. NSBlock is a virus which installs browser extensions to have better control over the infected computer. You should follow instructions below to delete this extension from your browser. Once these steps are finished, NSBlock should be removed from your Microsoft Edge browser. Here, select NSBlock and other questionable plugins. Click Remove to delete these entries. Now you will see Reset Firefox to its default state message with Reset Firefox button. Click this button for several times and complete NSBlock removal. Here, select NSBlock and other malicious plugins and select trash icon to delete these entries. Click Reset to confirm this action and complete NSBlock removal. Here, select Extensions and look for NSBlock or other suspicious entries. Click on the Uninstall button to get rid each of them. Now you will see a detailed dialog window filled with reset options. All of those options are usually checked, but you can specify which of them you want to reset. Click the Reset button to complete NSBlock removal process. ^ Difference between freeware, free software, open source, shareware, trialware, etc. TheWindowsClub. Windows 10 Tips, Tricks, Help, Support, Downloads, Features. ^ Pieter Arntz. What are trojans?. Malwarebytes labs. The Security Blog From Malwarebytes. ^ Emily Holehouse. What are ransomware attacks and why are they so successful?. Lanspeed. Managed IT Services - Tech Support - Strategic IT Consulting. ^ How does PPC Work?. Farotech. 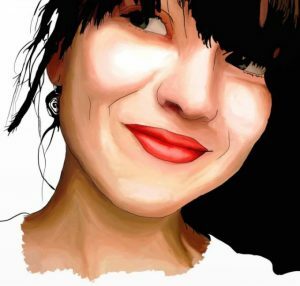 Blog | Farotech. ^ Phishing definition. Webopedia. Online Tech Dictionary for IT Professionals. This entry was posted on 2017-03-27 at 03:58 and is filed under Adware, Viruses. You can quickly scan the QR code with your mobile device and have NSBlock ads manual removal instructions right in your pocket. How did you remove NSBlock ads?